Green Writers Press, 9780997452846, 266pp. A high mountain lake in the Colorado Rockies is the point of departure for these stories of dark adventure, in which vividly drawn landscapes provide an immersive setting for narratives about coming of age, altered states, moral slippage, romantic love, sexual jealousy, and impenetrable loneliness. Fishing guides, amateur sportsmen, teenage misfits, scientists, mountaineers, and expatriates embark on disquieting journeys of self-discovery in far-flung places: the hazardous tidal waters of Nantucket, the granite quarries and ski slopes of New Hampshire, Venezuela’s Orinoco basin, the ancient squares and alleyways of Rome and Granada, the summit of an Andean volcano, and the tension-filled streets of eastern Cuba. Classic in feel and fresh in approach, the stories in A FIELD GUIDE TO MURDER AND FLY FISHING speak to the inextricability of exterior and interior experience; to the powerful magnetism of solitude versus friendship, brotherhood, and love; and to the urgent need for a more direct engagement with the planet that sustains us. 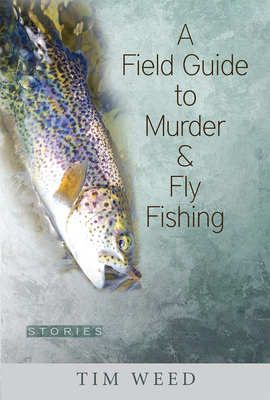 A FIELD GUIDE TO MURDER AND FLY FISHING has been shortlisted for the New Rivers Press Many Voices Project, the Autumn House Press Fiction Prize, and the Lewis-Clark Press Discovery Award. Stories in the collection have appeared in Colorado Review, Gulf Coast, Saranac Review, and many other literary magazines, reviews, and anthologies. “The Afternoon Client” won the 2013 Writer’s Digest Popular Fiction Awards, and “Tower Eight” was the Grand Prize winner for Outrider Press’s The Mountain anthology. Other stories have been nominated for the Pushcart and Best of the Net anthologies and shortlisted for the Tucson Festival of Books Literary Awards, the Lightship International Literature Prize, the Glimmer Train Short Story Award for New Writers, the Rick DeMarinis Short Fiction Award, the Alligator Juniper Award for Short Fiction, and the Richard Yates Short Story Awards. Tim Weed teaches writing at Grub Street in Boston and in the MFA Writing program at Western Connecticut State University, and works as a featured expert for National Geographic Expeditions and is the co-founder of the Cuba Writers Program. His first novel, Will Poole’s Island (Namelos, 2014), was named one of Bank Street College of Education’s Best Books of the Year. Read more at timweed.net.